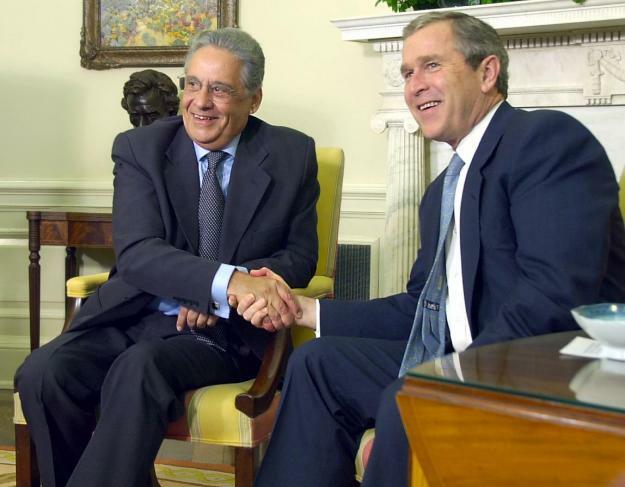 Bush and Cardoso: And tell me, George, do you kill people in Texas? Supposedly George W. Bush once asked Fernando Henrique Cardoso, then president of the land of order and progress, Brazil: “Do you have blacks, too?” Condoleezza Rice, Bush’s Brazilian wife, stepped in to save the day by explaining, “Mr. President, Brazil probably has more blacks than the USA. Some say it’s the country with the most blacks outside Africa.” There is some doubt about whether the story is really true; but it seems right, one of those recurrent moments that persuaded one Bush was not merely dumb but had fried some sequence of synapses during a massive drug trip at Burning Man or Bohemian Grove years before, and now had flashbacks in which Africa was entirely populated by clones of the Osmond family and all the mosquitoes buzzing round the White House bore the face of Saddam Hussein. I mention this only because Brazil’s 2010 census results, just released, show that for the first time a majority of the country’s residents define themselves as black or mixed-race: 50.7% of the population, as opposed to 44.7% ten years ago. (To be precise: 7.6% identify as black, and 43.1% as mixed-race.) The percentage calling themselves white fell from 53.7% to 47.7%. In Salvador, a former slave port with one of Brazil’s largest black populations, the findings were even worse: whites earned 3.2 times more than blacks. A parallel study, released this week by the Data Popular Institute, provided further evidence of the racial divide that continues to blight Brazilian society. The wealthiest group of Brazilians – known as “Class A” – was made up of 82.3% white people and just 17.7% African-Brazilians. In contrast “Class E” – the poorest section of society – was 76.3% African-Brazilian and 23.7% white. The same study found that 31.3% of Brazil’s white population had private health plans, compared with just 15.2% of the black population. In an interview this week Ivone Caetano, a prominent African-Brazilian judge in Rio de Janeiro, painted a bleak picture of life in the place some call South America’s “rainbow nation”. In other words, the “racial democracy” still has a long distance to go. On the other hand, it’s a moment that inspires a certain awe. The African diaspora, who built most of the two American continents when enslaved, now commands a majority in the hemisphere’s emerging superpower. As the world realigns itself and the United States and Europe decline, I find myself much more interested these days in Brazil than in, say, China. For better or for worse, in hope and in despair, it seems to me that much of our global future is being test-driven there. NB. Be sure to check the comments for some more information on the census from Brazilian activist Sonia Correa. This entry was posted in Economic Justice, Human Rights, Politics, Uncategorized and tagged Afro-Brazilians, Brazil, Bush, Cardoso, census, Condoleezza Rice, mixed race, race by scottlong1980. Bookmark the permalink. Thanks, Sonia, that’s extremely helpful in understanding this. I think the point about self-identification is particularly important. It adds to one’s sense of the moment’s significance — since the majority isn’t a matter of biological reproduction but of political construction as it were; it’s a majority that’s willed itself into being as a political fact.